More than 15,000 people responded to Free Code Camp’s 2016 New Coder Survey, granting researchers (like me!) an unprecedented glimpse into how people are learning to code. The entire dataset was released on Kaggle. Here are the 6 most popular coding jobs and the (very different) types of people drawn to each. *UX designer was a default option in the original survey. Though the degree to which it is a coding job is debatable, a basic understanding of code is helpful. 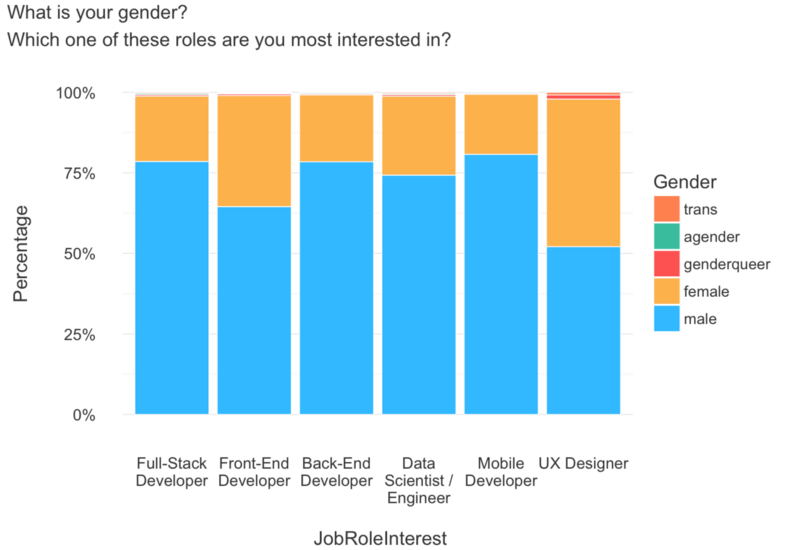 UX designer is by far the most diverse discipline in terms of gender, with 52% males, 46% females, and the highest percentage of agender, genderqueer, and trans respondents (2%). 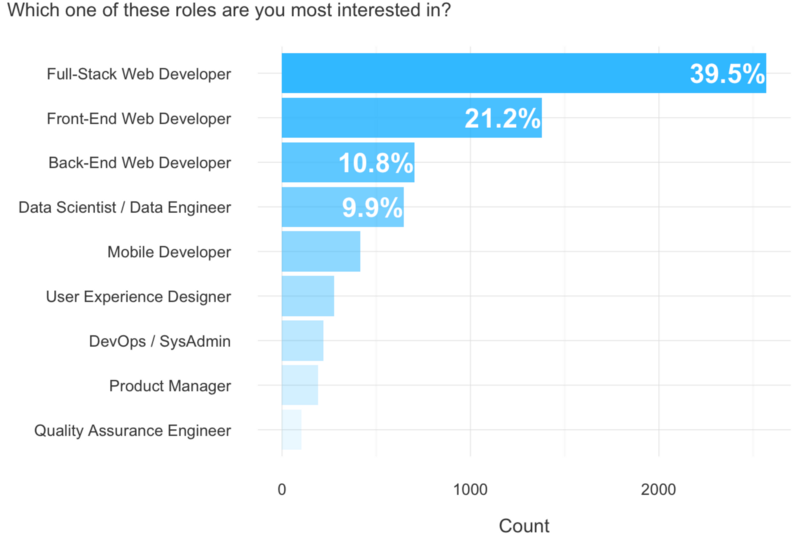 Mobile development is the most male-dominated discipline at 81%, though full-stack and back-end development are close. 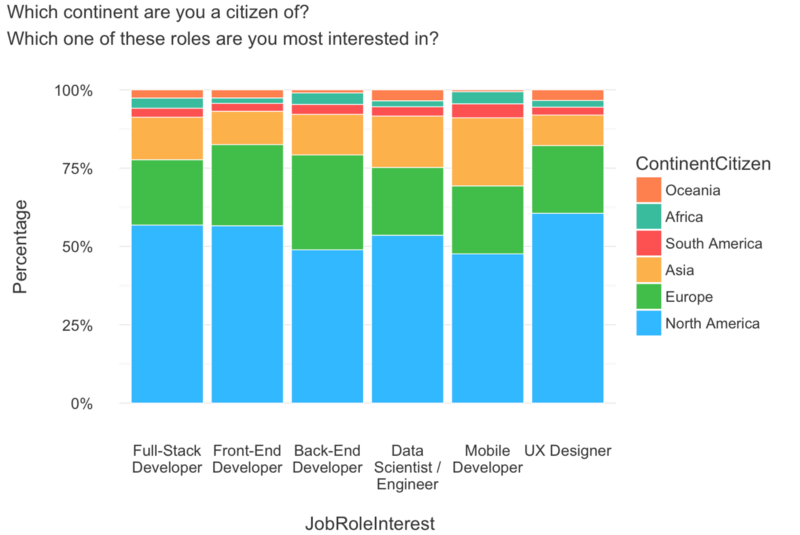 Mobile developer is the most diverse role in terms of citizenship. UX design is the most North American of all of the disciplines. Free Code Camp is based in the United States, which explains the tilt towards North America. Data science and data engineering are most skewed towards post-secondary studies. Mobile development has the highest percentage of respondents with no, some, or only a high school education, though back-end development is a close second. I wonder if these skews will reflect themselves in the form of age. By the way, here’s how to read this chart (and the other box plots in this article): the “x” is the mean. The horizontal line is the median (a.k.a. the 50th percentile). The bottom of the box is the 25th percentile, and the top of the box is the 75th percentile. Whisker length is 1.5 times the height of the box. The circles are outliers. All y-axes are on a logarithmic scale to better visualize the outlier-heavy data. 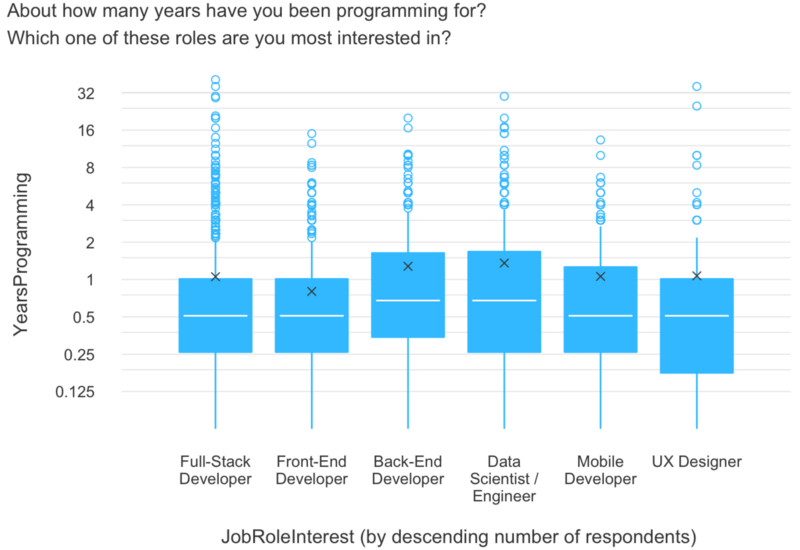 Data scientists-, data engineers-, and back-end developers-in-training have programmed the longest with a median experience of eight months. UX designers have the lowest first quartile — by two whole months — at two months. Programming experience is so positively skewed that some of the means, which should be taken with a grain of salt, are above their third quartile. 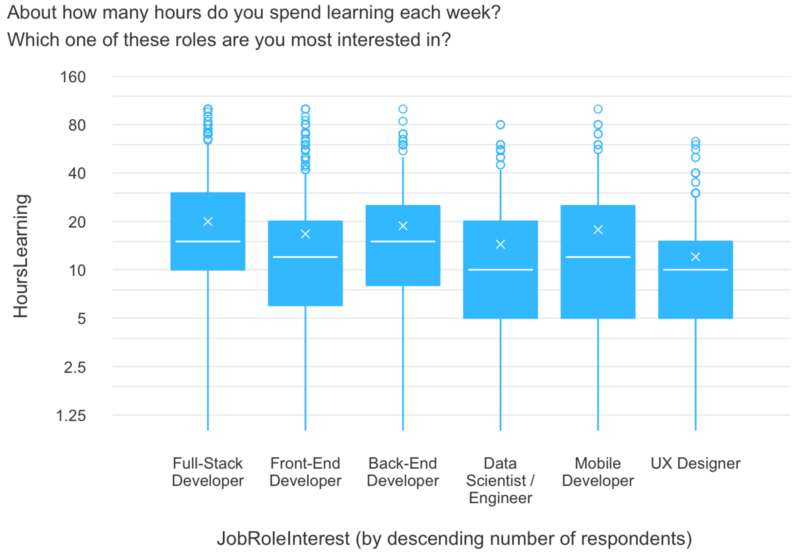 Full-stack developers dedicate the most time to learning each week, with 25% of respondents dedicating 30+ hours weekly. UX designers spend the least amount of time learning per week with a mean of 12 hours per week. 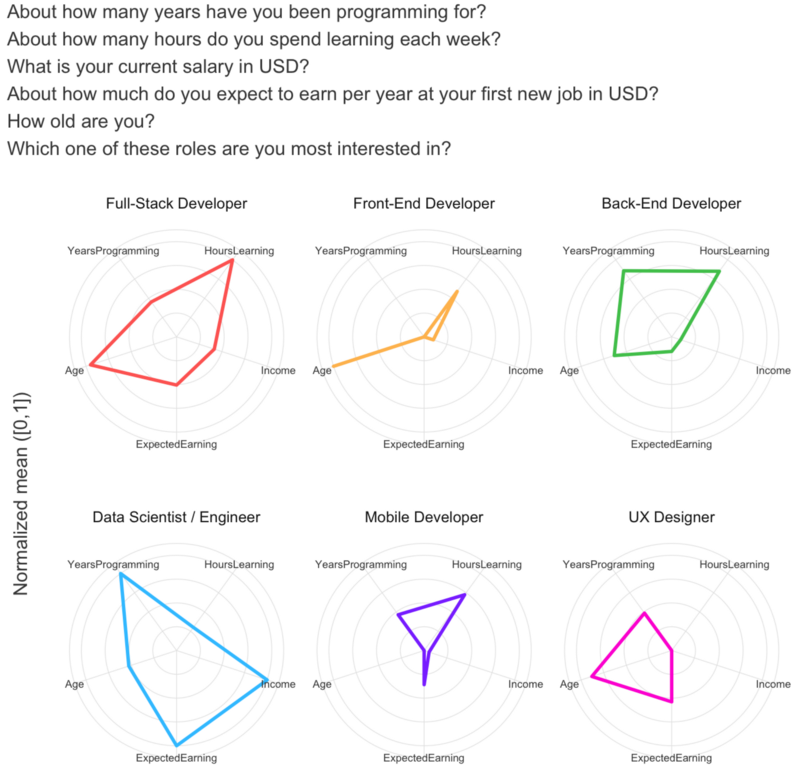 Aspiring data scientists and data engineers clearly have the highest current salaries. Their third quartile of $60k per year is $8k higher than the next highest discipline. There isn’t much income differentiation between the remaining job roles of interest, though all are above the 2014 US median income of $28.9k. Those interested in data science and data engineering expect to earn the most at their next job, with a median expected salary of $60k. Front-end developers are the least optimistic discipline (and yes, this difference in means is statistically significant). Note that expected salaries are higher than current salaries across the board. 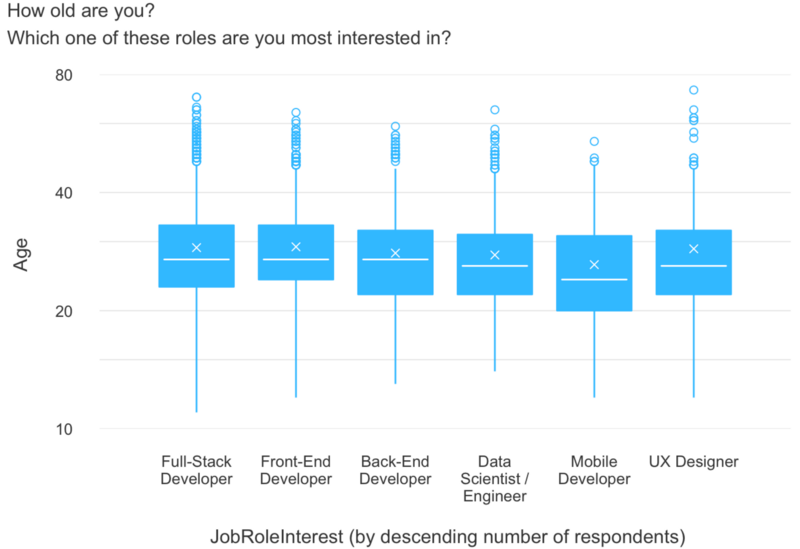 Front-end and mobile developers have the smallest areas, thanks to the lowest programming experience and expected next salary means for the former, and low age and current salary means for the latter. Note that we are strictly using this plot to efficiently compare roles across several numerical variables, and not to determine which role is better if such a determination even exists. Perception of strength based on overall area is a common misinterpretation of radar plots. A lot! Each type of programmer has a unique set of characteristics. Relatively speaking, females appear drawn to user experience design. Asians, South Americans, and Africans appear drawn to mobile development. Data science/engineering and mobile development stick out as the most and least seasoned in terms of education, respectively. 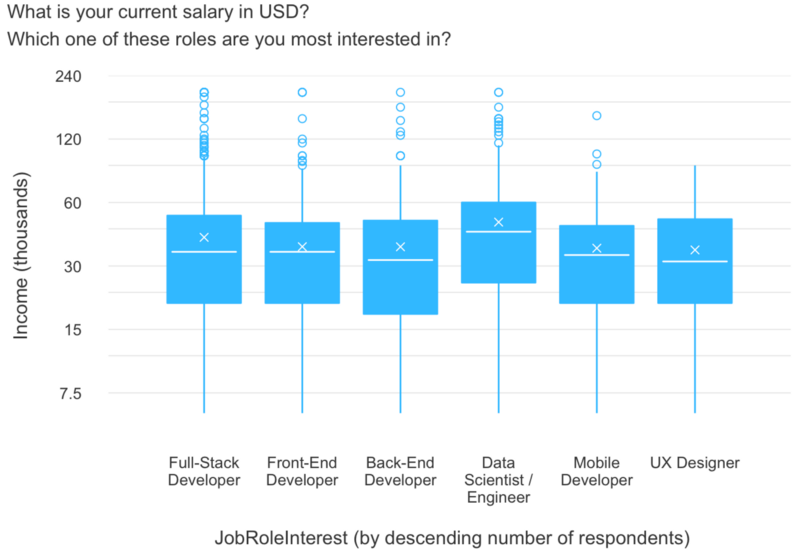 Aspiring data scientists/engineers have the highest current salaries, expect the highest next salaries, and have the most programming experience. Front-end developers are the oldest, but not significantly. Full-stack developers dedicate the most amount of time to learning per week. 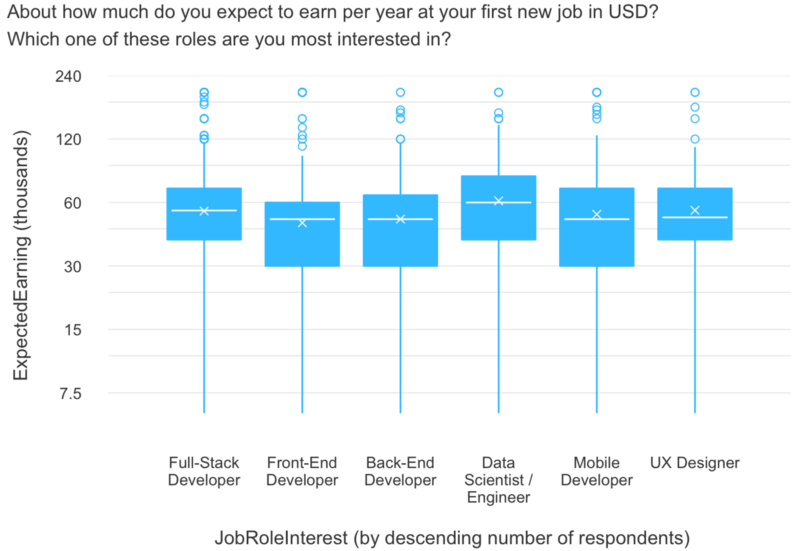 Front-end developers are the least experienced coders and expect the lowest next salaries. UX designers spend the least amount of hours learning weekly and have the lowest current salaries, but not significantly for the latter. Mobile developers are the youngest.